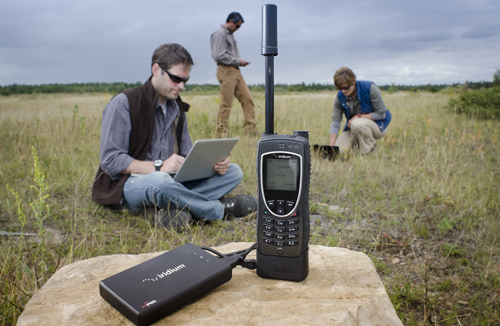 Iridium AxcessPoint Wi-Fi accessory allows users of Iridium satellite phones to create a Wi-Fi hotspot and share the Internet connection with nearby smartphones, tablets and laptops. Plug and play functionality – simply connect the Iridium AxcessPoint via USB cable to an Iridium satellite handset and the AxcessPoint will automatically establish a satellite data session without additional setup required. 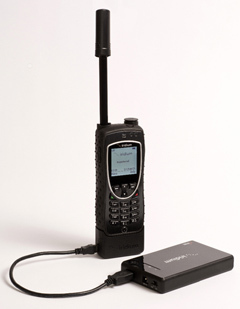 Small, light and portable – the AxcessPoint offers a Wi-Fi range of 60 to 100 feet (20-30 m). Without being confined to one stationary position, users are able to move around with their mobile devices connected to the satellite network via the AxcessPoint. Multiple connections – the AxcessPoint can connect several Wi-Fi devices (smartphones, tablets, laptops) for emailing and light web browsing. Iridium AxcessPoint can be used in conjunction with Iridium 9505A*, 9555 or Extreme satellite phones, and requires an active satellite phone subscription with data service. Once your AxcessPoint is connected to the Iridium phone and turned on, it will automatically establish a satellite Internet connection. You can connect your Wi-Fi enabled devices to browse the Web, send emails, transfer files. 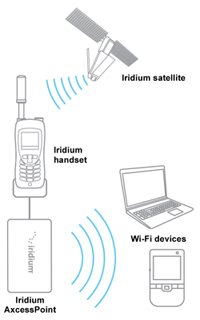 Usage charges are billed to the Iridium subscriber per minute once the Internet connection is established, until you disconnect the satellite phone or switch off the AxcessPoint. NOTE: Please be advised that Iridium data speeds for the Wi-Fi hotspot are narrow-band and very slow (just 2.4 kbps), however, data speeds can be optimized with the use of email & web acceleration software, such as Iridium Mail & Web App or SATTMail. This will usually allow users to use email (for text only) and limited Web browsing. Read Product Advisory. Due to the low speed of Iridium data connection, most of the apps on mobile devices (iOS, Android, Blackberry) may not work properly. For the AxcessPoint, we only recommend using text email, optimized Web browsing and weather downloads. * For 9505A users: Data Adapter (p/n RDA0401) and USB cable (p/n UTSA1201) are required for connecting 9505A phone (sold separately). The AxcessPoint must have firmware 2.6.6 or later. Note: Iridium satellite handset is NOT included.